This project will deliver a step change in efficiency and performance to the world of manufacturing by bringing together the advances in three domains – the Internet of Things, Social Media and Engineering Asset Management. Emerging sensing technologies allow condition monitoring of machines in a production system by equipping them with sensing, communication, data storage and data processing capabilities. Production plants will have “intelligent” machines (represented by digital twins) join a social network specifically designed to enable M2M communications. The machines will provide “status updates” to the social network, thus sharing their condition and operational status with other machines subscribed to the network. Imagine a world where individual machines in factories around the world collect, upload and share operating performance data via a social network - the possibilities for machine learning and optimisation are significant. Machine status updates will enable plant managers to develop system-wide maintenance plans that optimise reliability, productivity, energy consumption and product quality etc. Intelligent machines (enabled by software agents) will be able to learn from each other, identifying “best practices” for problem solving (e.g., reduce load to improve reliability). The data generated will enable machines to behave in a manner that optimises system-level performance. Machines will be able to advise each other on how they can collectively achieve system performance targets (e.g., one machine instructing another to speed up or slow down in order to maintain production goals while minimising risks). Finally, machines will also be able to optimise their own performance so they “help” other machines (e.g., lower the load for a downstream machine whose condition is deteriorating – as realised through its status updates) such that system cost-risk-performance balance is optimised to generate long-term value. In short, Manufacturing of the Future will be enabled by a society of cooperating machines – very similar indeed to human societies! 1. Demonstrator development. We are developing a prototype physical demonstrator of a production system where assets are equipped with digital twins and can communicate with each other and work collaboratively through a 'social network platform'. 2. Collaborative prognostics. This research aims to develop algorithms that enable machines to work in a collaborative fashion, learning from each other to improve their failure prediction capabilities. 3. 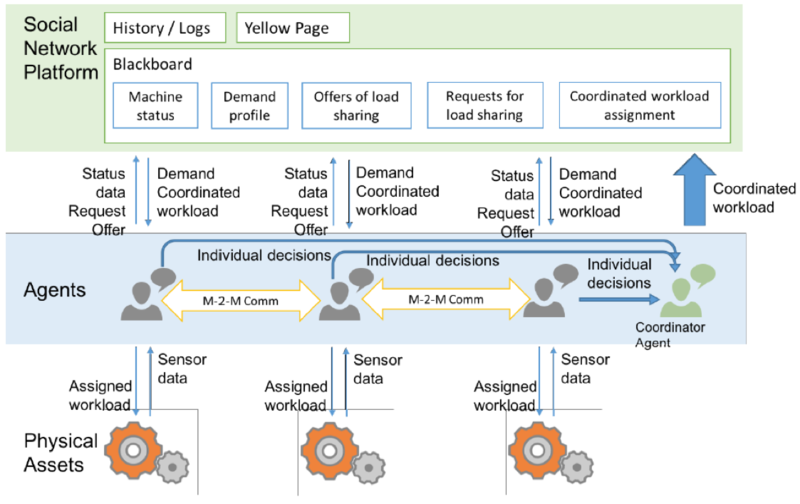 Distributed load management and maintenance. This research aims to develop algorithms that enable a set of similar machines in a system to work together as a team and decide their own production schedules and load considering the optimal value delivery for the system as well as their own health management and associated costs. Li, H., Palau, A.S., Parlikad, A.K., "A Social Network of Collaborating Industrial Assets," Proceedings of the IMechE Part O: Journal of Risk and Reliability, 2018. 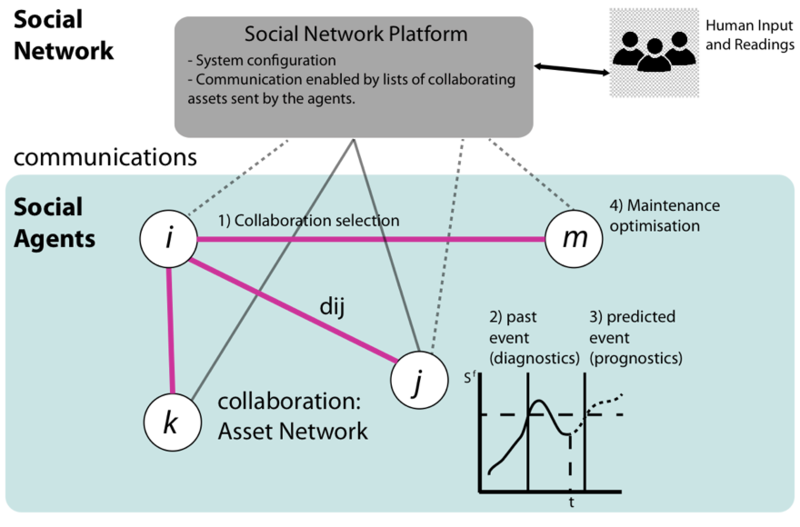 Palau, A.S., Liang, Z., Lutgehetmann, D., Parlikad, A.K., "Collaborative prognostics in social asset networks," Future Generation Computer Systems, 2018.